This fellow St. Patrick has been celebrated in this country for more than 200 years and in Ireland for close to 2000. We have a storybook on my son’s bookshelf that we’ve read over the years which tells the most familiar story. It’s about a young boy named Maewyn who was born to a tax collector in the Roman British empire. This version of the story tells that he was sold into slavery and shipped to Ireland. His captors forced him to herd sheep and he did so until he escaped 6 years later. A more recent version has the wealthy young Maewyn selling his own slaves in order to buy passage to Ireland so he can escape the fate of becoming a tax collector like his father. Clearly, that has stirred up controversy. He’s said to have driven snakes from Ireland although most biologists agree that there were never snakes on the Emerald Isle. He’s credited with using a shamrock to teach the Holy Trinity . He loaned his cloak to a man who was later in a fire but the man was never burned. He changed the liquid poison in his cup into ice when a wicked wizard was attempting to poison him. The sun didn’t set for 12 days following his death. He gave several generations an excuse to ingest copious quantities of Guinness and green beer on the anniversary of his death. When I was young, we had corned beef and cabbage on this day. My grandmother did it in the pressure cooker where it cooked quickly retaining its goodness yet became incredibly tender. It was served with potatoes. Now I live in the Southwest and no one in my family is a corned beef fan. Our version is to cook up cabbage, abundant in our CSA right now, with sauce and spices to inspire a twist on this St. Patrick’s holiday. Clearly, this can be viewed as stirring up controversy. Chop cabbage into thin strips, set aside. Saute onions and garlic in olive oil until translucent in a large skillet. 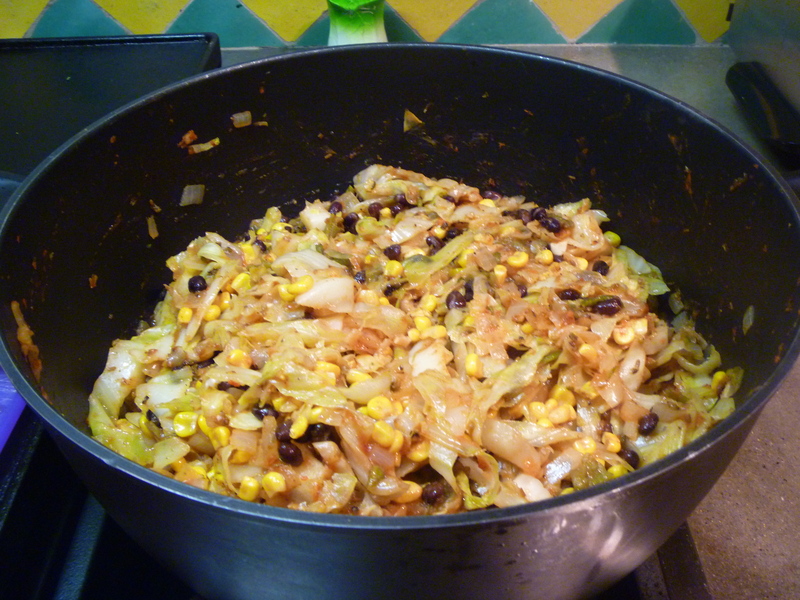 Add cabbage, tomato sauce, chilis, paste and spices. Reduce heat to medium and cook until cabbage is tender, about 10 minutes. Turn off heat and stir in frozen corn until evenly distributed. Salt to taste and adjust spices as desired. Mix in black beans before serving. Break corn tortilla chips into small pieces and sprinkle over top before serving. For me, just not wearing green stirs up controversy, as Irish as I am. In these parts (meaning Boston, to my south), Saint Patrick’s Day festivities abound. No corned beef happening in my household. I’ll definitely hang onto this recipe (even though it’s radical) and try it soon. I can smell it from here! I will be wearing a bit of green! In October, we will have our 20 year also! I grew up always having Corned Beef and Cabbage (my maiden name is Doyle) , my Mother and Dad always wanted to go to Ireland. After Daddy died Momma said now or never. When she got back she said she was at peace for her eyes touched the soft green of Ireland and her feet walked upon it’s soft soil. She died from a heart attack two days later. I still celebrate the Celtic heritage that is a father’s birth right. The darling child is perfect for this post! His hair doesn’t usually look so red but the sun caught it perfectly and I couldn’t think of a better photo. Wonderful picture of the modern Maewyn. I will enjoy fixing this cabbage dish tonight. The anser to my question this morning on what to fix my vegetarian guests. Yummy idea. The history lesson new to me and celebrating with some Irish it will be fun to share! Let me know how you like it Sally. We are having it too. So great to hear from you Judy and we look forward to seeing you this summer. a nice reminder that this wasn’t always an alcohol-fueled holiday. as much as i like a good evening of dancing and drink, i stay home on this particular date. too many amateurs out there! one of my gents is from Limerick. and he hides out on this day as well…i’d imagine that it’s got to give him a bit of a headache! I think we’ll be home tonight too Daisy. Have you visited Ireland? Haven’t been yet, but hope to within the next few years! Fingers are definitely crossed, as i know it must be wonderful! Me neither and really hoping to go. We love St. Patrick’s day. I learned how to corn my own beef, which will be cooked in Guinness. We will have sides of cabbage, potatoes and carrots that have been roasted, and my neighbor’s recipe for Irish soda bread. We’re not Irish, but we enjoy experiencing our little version of the holiday. You have the perfect Maewyn! Mmmm. Sounds great Lisa. I should have made my way past your house today. Those will be great leftovers too. How do you corn beef? I made a few changes: I cook it in the crockpot with Guinness, carrots and onions, while roasting the potatoes, extra carrots and onions sepatately in the oven. I blanch and sauté the cabbage. I would use my pressure cooker to cook the beef, but it’s not large enough to hold a brisket. Perhaps you can stop by this week for lunch and we will have the leftovers! Of course, we dont celebrate St.Patricks day here in India but I have read about him. I love steamed cabbages. Cabbages are my favorite. Rukmini, that sounds delicious! I love cabbage and that recipe sounds great. I love to watch Irish dancing! I’d do that anytime rather than watching the crowds puke green. Tammy, loved all of this . . .your humor, your writing, your Maewyn, and the history lesson and recipe. Not much celebrating going on here. Except we went for Shamrock shakes . . .and they were out! haha! Thank you! Ha! I forgot about shamrock shakes. Our plans actually changed at the last minute and we aren’t having that cabbage until this afternoon. Well, after posting this, I learned that my husband and my oldest do also. Guess I’ll make it next year. See the way that Rukmini suggested it as well. It sounds delicious. Sounds delish, Tammy. And I love your modern Maewyn . . . he’d charm the wee beasties for sure! Certainly looks Irish in that photo, doesn’t he? Great stuff! I still use a pressure cooker for cabbage; it’s a great way to contain the cooking odor. When it’s done I take the cooker out on the patio and let the steam escape out there. Your southwestern version sounds really good! I usually just chop up some seitan and add it to the cooked cabbage to make a mock St Paddy’s feast. Funny that St Patrick’s Day is celebrated in Ireland about as much as Cinco de Mayo is in Mexico, i.e. not too much at all. It makes me wonder if people in other countries might celebrate Grover Cleveland’s birthday and have big drinking parties, thinking that’s what Americans do. 🙂 Whatever the case we all have a good time, and I suppose that’s the big idea. We celebrated by visiting the Desert Botanical Garden’s plant sale and were able to scoop up two Boojum trees! Score! I love a pressure cooker and I love the DBG. You probably know that I sit on their board of trustees. It’s a magical place. I was supposed to go to the plant show preview on Thursday night but my HS freshman got called up to play varsity and the game trumped. Boojum trees rock too! Game on! Fantastic crowd at the DBG sale; parking lots were nearly full. Sorry that today must have been a wash out, but I suppose that means a bigger plant selection outside the gift shop. The cabbage sounds delicious–I may have to try it next year since we have given up the corned beef as well. Cabbage is something that I have trouble using up. We aren’t big slaw eaters although I do like it shredded on fish tacos. I made some great vegan cabbage rolls that went over well with rice and lentils. Whatever is or isn’t true about the legend of St Patrick, he caused a great public holiday with a wonderful celebration. I like corned beef but no one in my family likes it so I don’t cook it too often. But we all like cooked cabbage. Great recipe! I thought no one in my family did when I posted this and now, I’m hearing a couple of them say how much they like it! Put one in the freezer for later. I love your Mexican cabbage! Wonderful idea for a vegetarian on St. Patrick’s day. It went over really well! I am so looking forward to making this! My husband loves cabbage and I’m never sure how to make it for him. I am certain he and I both will love this recipe. Thank you! I’m always looking for new things to do with cabbage and this was a hit. and I am intrigued with corning my own beef (thanks to Lisa’s comment and link above) it is far more likely in this mostly vegetarian household that I’d make your Mexican cabbage dish—looks delicious. My husband and I were laughing that the title for next year’s post might be Corn Your Own Beef. Nor is their corned beef! I’m as Irish as they come. Green eyes and all. And I’ve never liked corned beef. My husband lived in the southwest for years and misses the flavors there. This recipe is going to be a must-try! With no controversy in this house – it’ll be a win-win! Well, if you read the other comments, you know I’ve been chastised by my family for saying that two of them don’t like corned beef. I will be making one sometime this year. Do they ever celebrate this in India Tes? I think you’d like the cabbage dish. Would have thought that there were some Brits who did celebrate the day in South Africa. And protecting butternuts from the monkeys? oh wow. We live in different worlds. Thanks for sharing. My husband’s British and apparently the English don’t celebrate St Patrick’s day as it’s an Irish holiday! Obviously, my Irish friends celebrate in style… however most of them have returned to Ireland…. 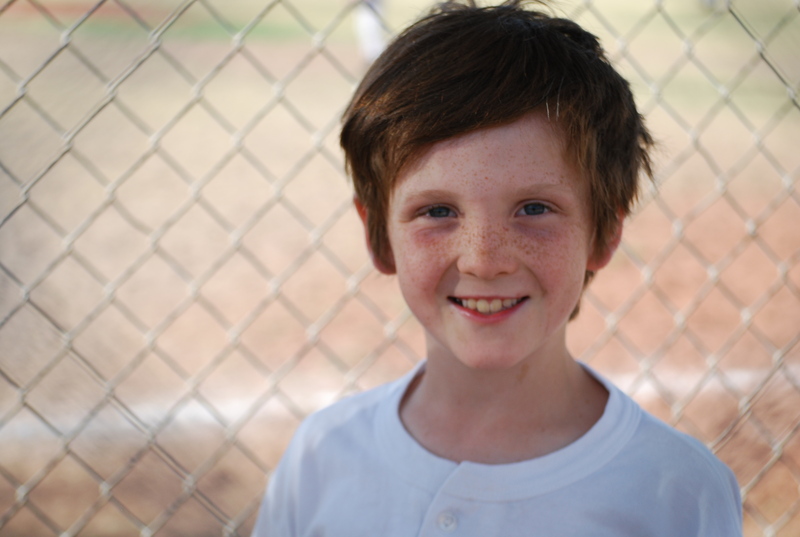 Omigosh – does your son EVER look Irish! I love St. Pat’s – even though I have some misgivings about dear Patrick himself and the American beer-soaked craziness is far afield from the celebrations in Ireland (until recently it was a religious family holiday ala Easter). My mom was SO proud of and into being Irish and I must say it’s rubbed off on me. And, though the corned beef came from the mingling of the Irish with Jews in New York and though I don’t eat beef the rest of the year I DO have the Irish-American typical boiled dinner on St. Pat’s and enjoy every bite. The cabbage recipe sounds grand – I’ll give it a try! Cabbage is a really healthful cruciferous vegetable, too – an important part of any diet wishing to be healthful. Do you make colcannon, Tammy? That’s another traditional Irish dish (that one really IS Irish, I believe) which I adore. I have a colcannon recipe on my desk and plan to do it with a proper corned beef later on – now that I know how much my guys like it!! Great story of the history of St. Patrick’s Day. I will pass the recipe on to my wife (of 21 great years) and I will continue to check in. Great post as always. Thanks Tim. It seems like there is a group of us with long term marriages. Yeah!! I never ever knew the story behind St. Patrick’s Day… how facinating! And the poem at the end… beautiful! Thanks Krista. I like that little Irish poem also. I am often thinking about the food when I am writing and then do the cooking afterwards. In this case, I went back and amended the post. This cabbage dish looks amazing! For some reason, I am always lacking inspiration when it comes to cabbage. I am actually posting a cabbage-ful recipe today on my blog. I am definitely going to try your recipe with my next head of cabbage. It has also been abundant in our csa boxes this season. We’ve had so much too. I also did some yummy vegetarian cabbage rolls with rice and lentils. Every year St. Patrick’s day reminds me of the three happy years I spent there. Cabbage and potatoes were very popular vegetables there. Your recipe – and Rukmini’s – sounds delicious. Something to try definitely. Not only on St. Patrick’s Day. Thanks Tammy. We actually had the last of our cabbage tonight in cabbage rolls. I’ve been surprised at how much the kids like them. I had no idea about the history so thanks for enlightening me! My Irish friends always tell me I’m crazy to think that the Irish eat corned beef and cabbage to celebrate St. Paddys Day, but I force them to maintain the tradition. Maybe next year I’ll give them your version to try instead – looks great! It’s very different but if you like Southwestern spices, it’s a great twist.